It's finally that time again. The time when Paris resembles all of its most flattering cliches. When the city is suddenly awash with color: cherry and apple blossoms, daffodils, or everyday flowers. The air may linger on the brisk side some days, and rain showers are definitely to be expected, but Paris in April is still worthy of the legendary songs and poems that pay tribute to it. Locals are generally in good spirits, and you'll want to spend lots of time outside when it's not raining. April is a great time to explore a few beautiful Paris parks and gardens, soak up any available sun and warmth on a cafe terrace (or flâner), and amble in a dramatic yet nonchalant way in one of the city's endlessly fascinating neighborhoods. As the true beginning of springtime in Paris, April is also perfect for enjoying activities as a couple. In April, the weather starts to get noticeably balmier, especially toward the end of the month. However, it can still be chilly, especially in the mornings and toward the beginning of the month. This isn't yet the time to shed sweaters and jackets and roam around in t-shirts and shorts. You should also expect quite a bit of humidity and prepare accordingly. As a general rule, temperatures at this time of year remains brisk, with temperatures at around 50 F. You might want to pack clothes that you can layer in case an unusually cool or warm day sneaks up on you. Bring light cotton shirts and pants in case of sun, but also pack a few sweaters, warm socks, and a spring coat. April is usually a wet month, and Paris is well-known for its erratic and sudden downpours. So packing an umbrella that can withstand strong rain and wind is definitely a must. Make sure to pack a sturdy pair of waterproof shoes. Rain during an April trip to Paris is more than a possibility, and you don't want to ruin your excursions with sloshy shoes and cold, wet socks. Also be sure to bring along a pair of shoes that are comfortable to walk in — Paris is a city where going by foot is often the best option. 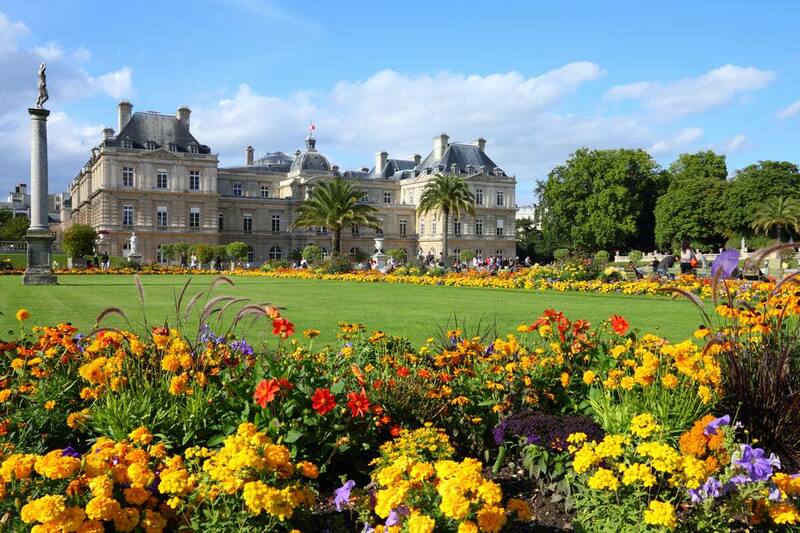 Think about packing a hat or visor and other sun gear for sunny days when you wish to spend time lazing in one of Paris' best parks and gardens. You may also want to bring along an extra light sweater in case you stay for a nap or picnic: as mentioned earlier, it isn't uncommon for weather to change suddenly, so your sunny sprawl in the park might suddenly turn to contending with chilly winds and cloudy skies. Easter in Paris: Admire elaborate, arty eggs, chickens and ducks in the shop windows of some of Paris' best chocolate makers — and taste a few samples, too! You can also enjoy special Easter meals, or even organize a spontaneous egg hunt in one of the city's lush parks. Passover in Paris: The high Jewish holiday often falls in April, and if you happen to be visiting Paris when it falls, there are plenty of wonderful and locally authentic ways to observe it. The Foire du Trone: Here's another one for the whole family. The Foire du Trone is an enormous fair complete with traditional carnival rides and food, games and activities for kids, live music and more. It's generally held on the sprawling lawns of the Pelouse de Reuilly. High season starts toward the end of April, so you should prepare for airfares, hotel rates and other prices to rise considerably. To lock in good deals, it's very important to book travel packages and flights several months in advance — or even a year ahead, if at all possible. Conditions can get annoyingly crowded at this time of year. Sometimes, a short excursion outside the city limits can be just the ticket. See our guide to the best day trips from Paris for inspiration and ideas. If those classic April showers threaten to dampen your enthusiasm, not to worry: there are plenty of wonderful things to do in Paris on rainy days, too. See our complete guide to the best time of year to visit Paris for more seasonal tips and suggestions, and this handy guide to weather in the French capital to help prepare for your trip.